Daniel Sedin scored just a little over five minutes into the series to get the top-seeded ’10-’11 Canucks off to an early lead. However, the 6th-seeded ’92-’93 Canucks would score three goals in almost four minutes later in the period to hold a 3-1 lead going into the second period of Game 1. They would not beat goalie Roberto Luongo again, though, as the top seed came back to win 5-3 with two goals in both the second and third periods. Both Daniel and Henrik Sedin posted a goal and two assists in the opening game. Game 2 would enter the third period tied 2-2, but defenseman Dan Hamhuis would score about two and a half minutes into the third for the game-winning goal for the ’10-’11 Canucks. The ’92-’93 Canucks got on the board in the series with a 5-2 win in Game 3. Pavel Bure led them with two goals and an assist while Cliff Ronning and defensemen Gerald Diduck and Jyrki Lumme would all tally two assists each. In Game 4, the two teams were scoreless after the first 20 minutes, but the ’92-’93 Canucks would score twice in a span of 13 seconds early in the second to take a 2-0 lead. Later in the period, Daniel would get the ’10-’11 Canucks on the board and then early in the third, Mason Raymond would tie it for the top seed. The two teams would finish regulation tied 2-2 and go to overtime. The ’92-’93 Canucks would score almost four minutes into overtime with Dixon Ward netting the winner to tie the series up at two. Game 5 would be the highest-scoring affair and the ’10-’11 Canucks would go on to win, 8-5. 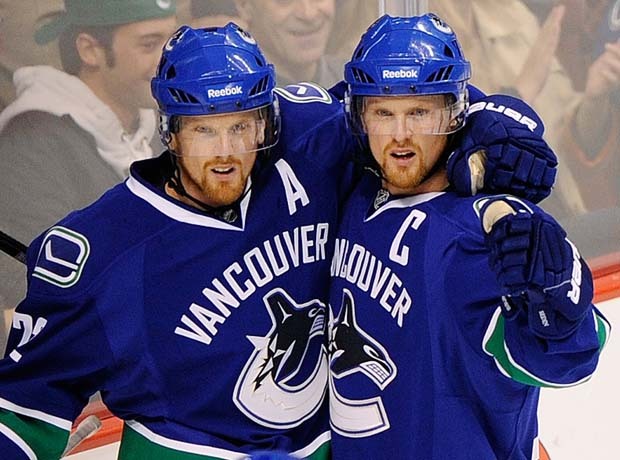 The Sedin twins combined for four goals and seven assists for a total of 11 points in the win. Defenseman Alexander Edler tallied four assists to help lead the top seed in their big 8-5 win. The ’10-’11 Canucks then stormed out to a 3-0 lead by the end of the first period of Game 6 to really put their foot on the ’92-’93 Canucks’ throats. They would hold on to win 5-2 to clinch another berth in the Ultimate NHL Playoff. The ’10-’11 Vancouver Canucks are the 29th team to qualifying for the upcoming 2015 Ultimate NHL Playoff. It will be their second trip to the tournament and they are the 18th team that will repeat as their franchises representatives. Up next is the 2015 St. Louis Blues Qualifying Tournament! This entry was posted in Qualifying Tournament, Ultimate NHL Playoff and tagged Alexander Edler, Christian Ehrhoff, Cliff Ronning, Dan Hamhuis, Daniel Sedin, Dixon Ward, Gerald Diduck, Henrik Sedin, Jyrki Lumme, Kirk McLean, Manny Malhotra, Mason Raymond, Mikael Samuelsson, Pavel Bure, Qualifying Tournament, Robert Kron, Roberto Luongo, Ultimate NHL Playoff. Bookmark the permalink.